Judging by the amount of emails I have had about this book, there is great anticipation for this book. I am glad to say that it is perfectly justified. Spencer Pollard does not need any introduction to most of us in the modelling community. His skill is well-known and his output is beyond us mere mortals. How anyone can produce so many quality models so quickly is beyond me - someone who is lucky to complete one model a year!! 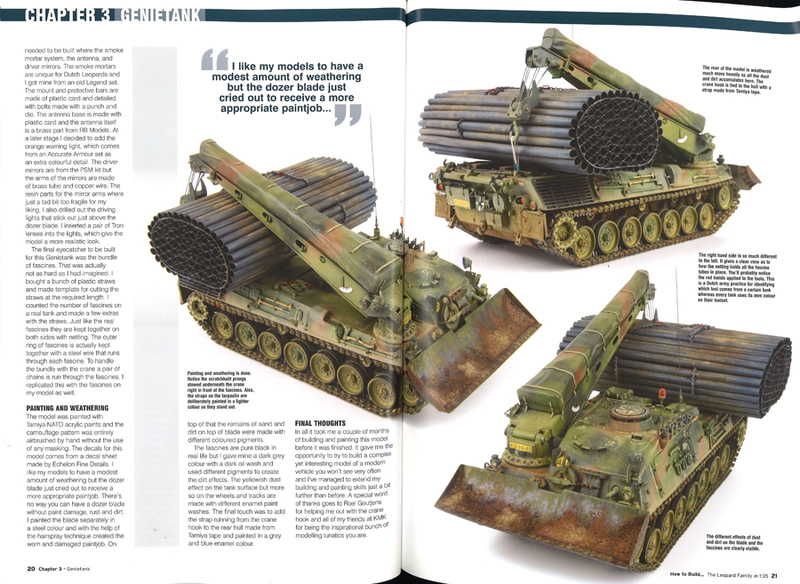 A brief look at the content reveals two different builds of the Takom Leopard C2 MEXAS from Spencer and also Brett Green. 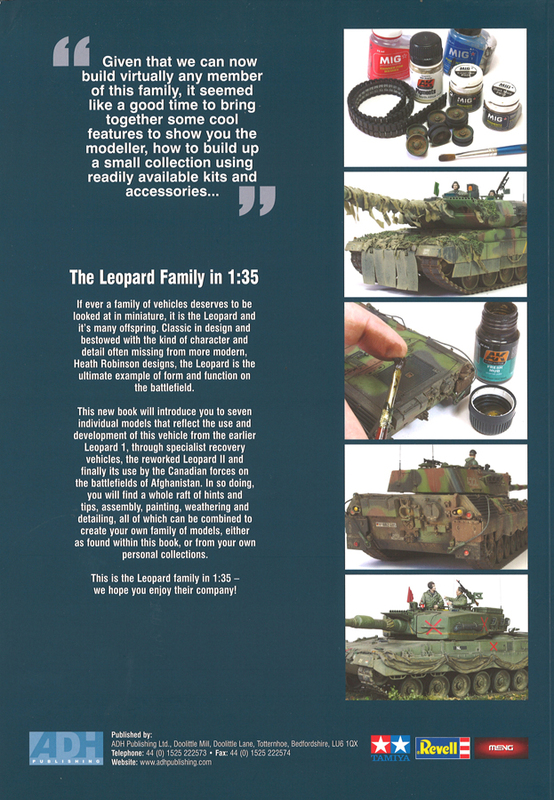 There is an accompanying article from our Leopard Club friend, Anthony Sewards, with a historical background to the same tank, and a 2-page walkaround. John Murphy contributes a build of a Danish Leopard 2A5DK which he has created by combining Tamiya and Hobby Boss kits. Another contribution comes from Marcel Jussen who has converted the Perfect Scale Modellbau Bergepanzer 2 ARV into a Dutch Army Pionierpanzer 1 AEV. Now I know why Marcel turned down the opportunity of featuring this amazing model in a Leopard Club article! 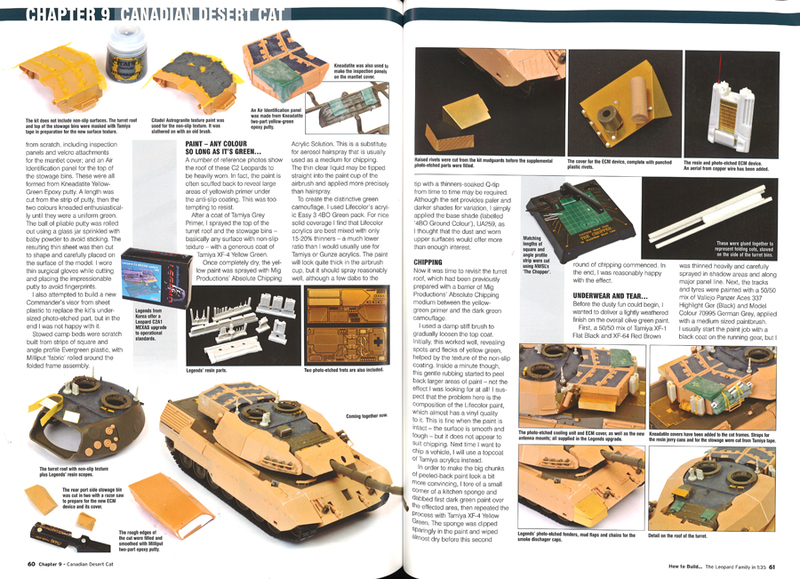 There is a brief look at what is in the box of the old Italeri Leopard 1A4, the very first 1.35 tank model that Spencer built and which he promises to revisit in the future as it is still such a good kit, even after all these years. Spencer digresses a little on the last page of the book, inspired by the thought of the Italeri 1A4, by wondering what it would be like to build some other older-tool models (such as Tamiya's Abrams or Bradley) and paint them using todays techniques. An interesting prospect. 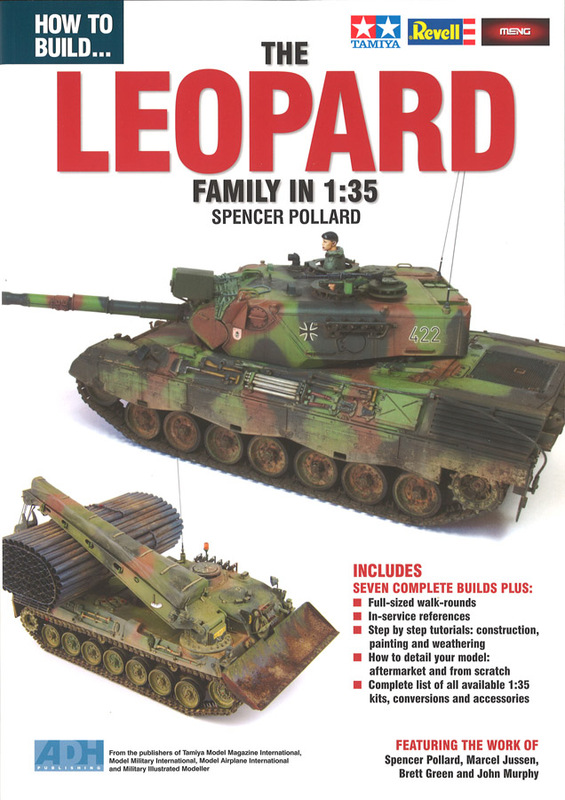 Spencer's other builds in this book are the Meng Leopard 1A3/1A4 more-or-less out of the box, a Dutch Leopard 2A4 using the recent Revell kit, plus a Bundeswehr Leopard 2A6 from Tamiya very effectively camouflaged with rubber skirts and cam nets. 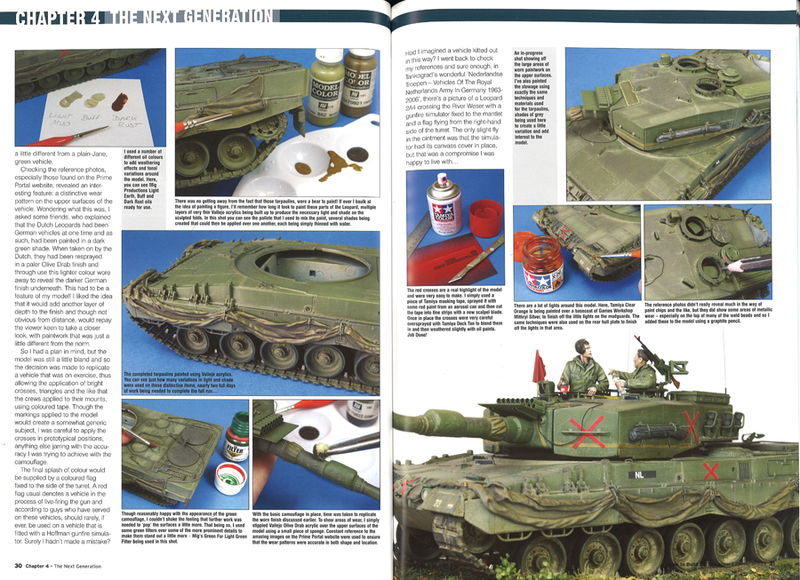 A real Dutch Leopard 2A6 is featured in four pages of detail walkaround shots from Rudi Meir. 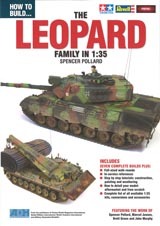 The 80-page book is rounded off with a brief rundown of after-market parts for which Spencer has referred to the Leopard Lists on our website. All of the builds are worthy of showing at any model exhibition, as you would expect from these modellers. The photos are very well reproduced, though a handful are a little on the small size. They are a feast for the eyes and each article has been written with a lot of building, painting and weathering information. There are some grammatical errors along the way, but nothing to distract from the quality of this product. It is nice to read that no punches have been pulled when it comes to comments on the kits themselves. Most Leopard models are, unfortunately, less than perfect, and any problems with the kits used are duly noted. 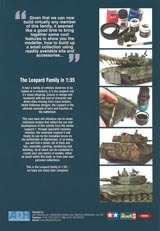 This book is a really good primer for anyone who is new to Leopard 1 and 2 modelling. There is a lot of inspiration here and if it doesn't kick start at least one Leopard project for the reader, I will be very surprised. Highly recommended and let's see a volume 2 one day. Spencer does suggest this might happen.